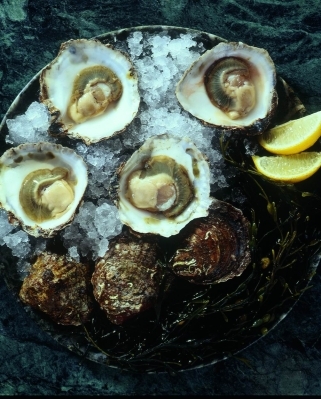 There are three main varieties available in the UK– Native, Pacific (or Rock Oysters), and Portuguese. The Native Oyster (available from September to April) is considered the best, but takes twice as long to grow, making it more expensive. Pacific are available year round. All Oysters should feel heavy for their size and be kept with the round ‘cupped’ part of the shell facing downwards to retain the moisture. Despite their modern image as a luxury food, Oysters used to be a cheap working class food, and used in a traditional British Beef and Oyster pie. Now commonly served raw with lemon and pepper, though stronger salsa type toppings are also used. 5. If oysters are needed for cooking then they can be briefly steamed or microwaved to open them.